Japan’s best airplanes are no match for the Buffalo built Curtiss P-40 fighters in spite of their numerical superiority, according to Captain C. James Crysler, of 27 Somerton Avenue, Kenmore, whose 62 combat missions as a member of the 74th Fighter Squadron in China qualify him as one who knows whereof he speaks. Captain Crysler, whose specialty was ground-strafing and dive-bombing in China and Burma during his 14 months in that theater, is spending a brief furlough with his parents at the Kenmore address pending reassignment. Credited with three Zeros and a probable fourth—all shot down during one two-hour dogfight over Kunming—he is also the holder of the Distinguished Flying Cross, the Air Medal, and the Chinese Order of the Cloud. Mandated as a second lieutenant in the air force in March 1942, Capt. Crysler was assigned as a pilot for a B-25. He ferried the ship to a base in India, and after a brief training, loaded it with bombs and took off for China. 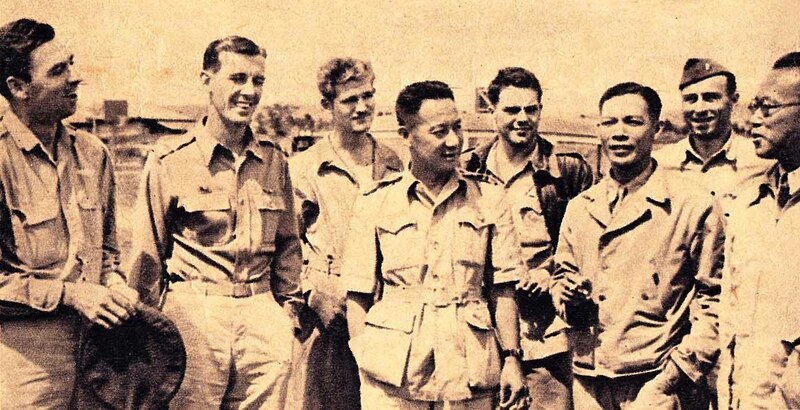 Crysler, his navigator and his bombardier were the only members of the crew of the “Yokahama Express” to escape injury when they parachuted down into the unfriendly mountains of the Burma-China border. The trio started walking. So there was Crysler—a bomber pilot without a bomber and with very little prospect of getting one right away. It didn’t take him long to decide what to do. On June 12, 1942 he started flying with the American Volunteer Group’s “Flying Tigers,” that group of flying daredevils equipped with Curtiss P-40’s. 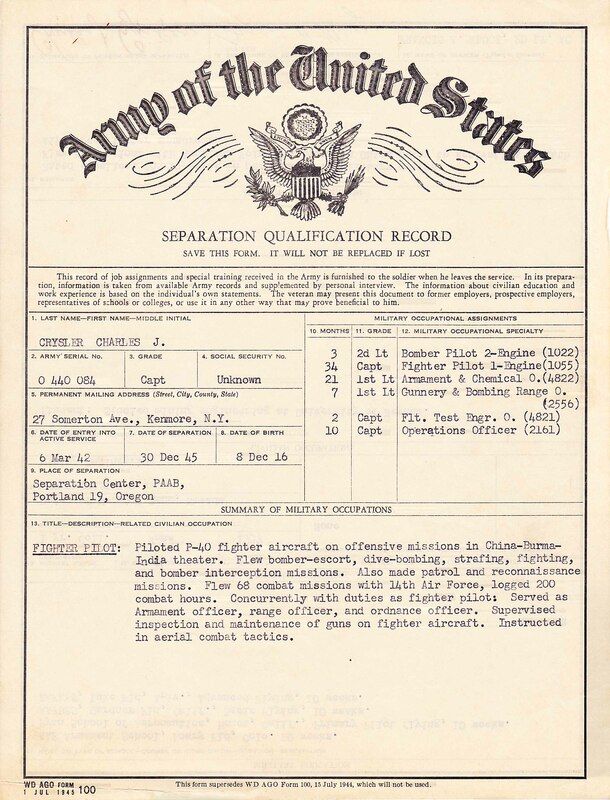 On July 4, the American Volunteer Group was disbanded and many of its personnel went over to the 14th U.S. Army Air Force, under command of Gen. Claire Chennault, founder and leader of the “Tigers.” Crysler was one of them, flying a P-40 with the 14th Air Force’s 74th Fighter Squadron. 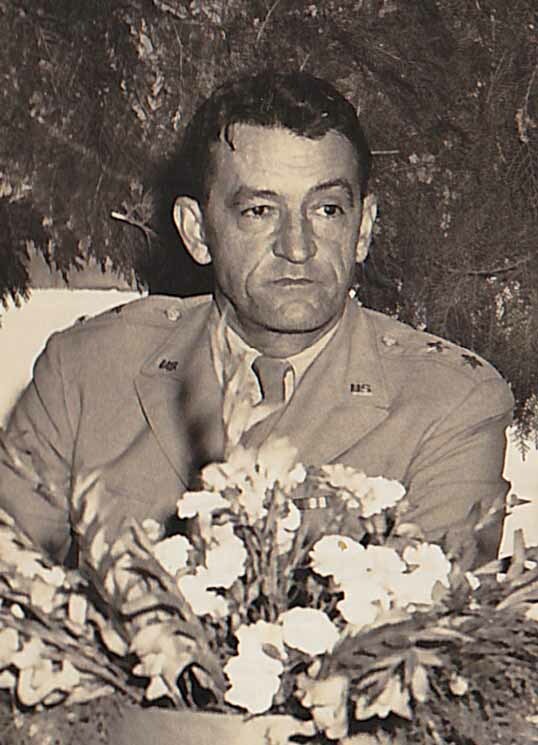 The high point of Crysler’s combat action occurred on May 15, 1943, when the warning net notified his base in Kunming that a “heavy force” of Japanese bombers escorted by Zeros was on its way in. 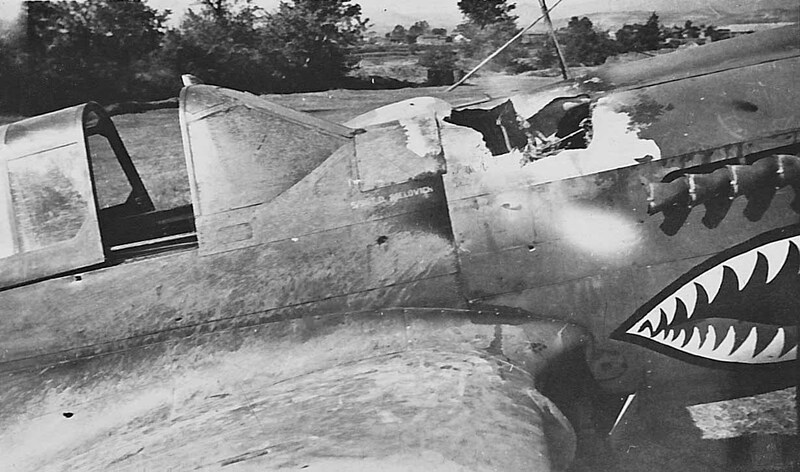 A damaged but intact P-40 after an enemy strafing. Crysler fulfilled his earlier assignment as a bomber pilot, only at the controls of a P-40, when he was briefed to attack Japanese installations in Burma with 500-pound bombs. In addition to blasting troop concentrations, bridges, etc., he is credited with sinking two big supply barges on a river in Burma. Nevertheless, Crysler came through the strenuous campaign with no injuries and his plane was never damaged. For the past few months he was detailed to an advance base in India, teaching combat tactics to Chinese and American fighter pilots. These lads, equipped with the latest model P-40 Warhawks, are “going to make it plenty hot” for the Japanese, Crysler believes. They are being taught the “know-how” of aerial combat by men who learned it the hard way in Burma and China, and by the time they tangle with the enemy they’ll be well prepared to give a good account of themselves, he says. 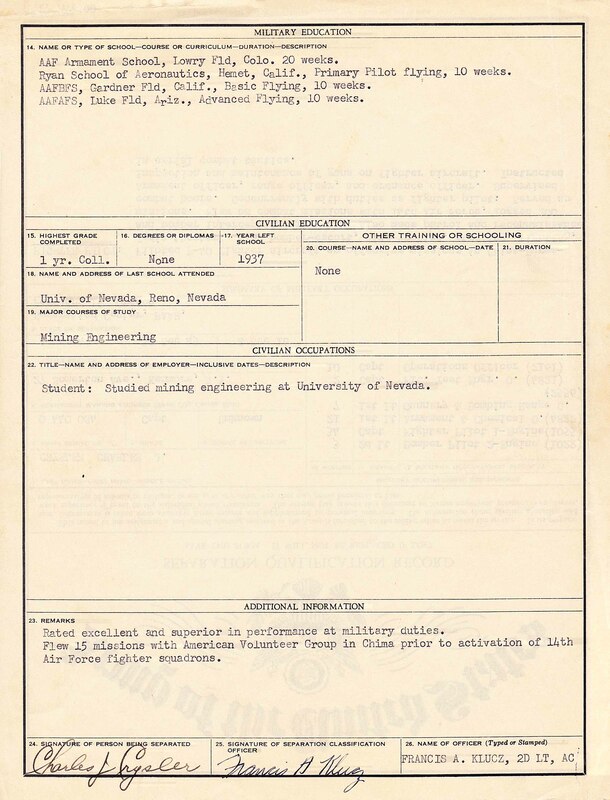 Before he went to Nevada to study mining engineering back in 1937, Capt. Crysler worked in the mailroom at the Curtiss Kenmore plant. 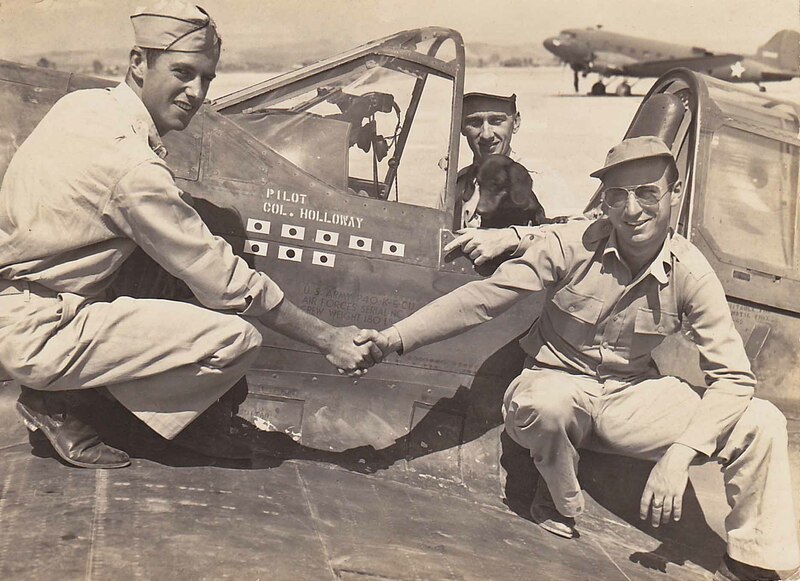 Lt. C. James Crysler (right), on May 15, 1943 in Kunming China, serving with the 23rd Fighter Group, 74th Fighter Squadron of the Flying Tigers. He had just shot down 3 confirmed and 1 probable enemy aircraft in his P-40E. Also pictured are Lt. Col. Bruce K. Holloway (center) with his dog Joe, who had one zeke and one bomber, and Maj. Roland M. Wilcox (left), who had 3 confirmed and 2 probable. This entry was posted in WWII and the "Flying Tigers" and tagged 1st American Volunteer Group, C. James crysler, claire chennault, Col. Robert L. Scott, Curtiss P-40 Warhawk, Flying Tigers. Bookmark the permalink. Ron: Thank you for sharing your father’s story with me – his war time adventures make for an exciting read. Perhaps one day we’ll read about your own exploits during the war in Vietnam. Cliff, I loved reading these stories–I remember hearing a few of them as a young child. To see my grandfather’s story here along with those old photographs really brings it back to life. When I first heard them, I wasn’t able to fully appreciate the magnitude of what he had done. Great job! As the granddaughter of General Claire Chennault, it is with a sense of pride that I read this story. My grandfather was so blessed to have such courageous men under his command. With his tactics, and their zeal and bravery, they were truly a force to be reckoned with. As Director of the Chennault Aviation and Military Museum, it is my honor to have these stories included in our collection. 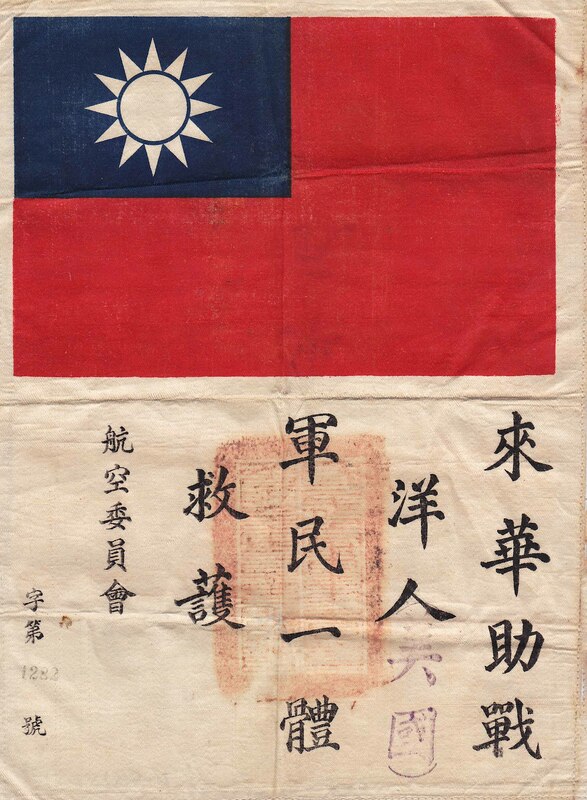 I will make a copy and include it in our personal accounts of the brave men who flew for China. Thank you for sharing, and I hope that we can continue to let the American people know the sacrifices that have been made on our behalf. THE FLYING TIGERS AMERICAN VOLUNTEER GROUP: THE MOST ELITE FIGHTER GROUP OF ALL TIME! This caption for the above photo incorrectly identifies Joe Rosbert as the fifth gentleman from the left. Although my father knew several (if not all) of the men in the photo, that is not Joe. I do not know who that is. I wish I could help you identify him but, in my research, I haven’t been able to do so. Thank you for letting me know. I have made the appropriate change to the caption beneath the photograph.